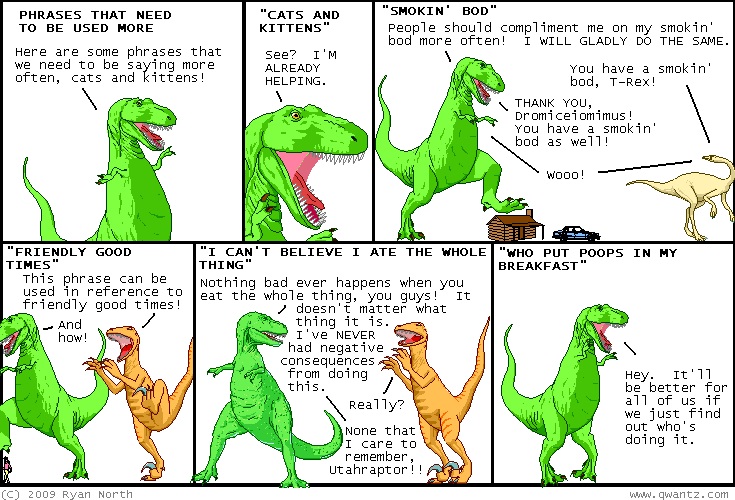 Dinosaur Comics - April 2nd, 2009 - awesome fun times! –However! I do have MANY unsolicited opinions on smaller, local issues! This comic is from April 2nd, 2009! I didn't write things down here back then. Or maybe I did, and they are now LOST FOREVER. But here is a random merchandise image; perhaps you are... tantalized? One year ago today: a phrase listing i read showed english speakers how to say, in korean, "Will you be my girlfriend? ", "I love you", and "Would you marry me?" in succession. if you're in that situation, having the phrases handy WOULD be a real timesaver.